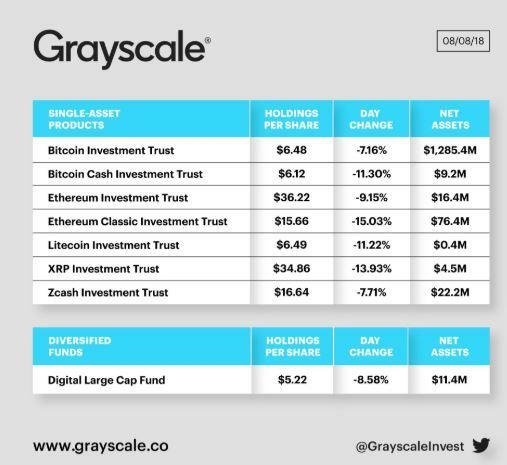 Grayscale, an investment trust focused on cryptocurrency, declared that holdings of Ethereum Classic [ETC] have exceeded other digital currencies. The announcement was made on on popular social media platform Twitter, after which it was retweeted on August 9 by Ethereum Classic [ETC]. The investment trust has mentioned that Bitcoin Cash [BCH], Litecoin [LTC], Ripple’s XRP, Zcash [ZEC] and Ethereum [ETH] were beaten by Ethereum Classic [ETC] on its list. The official page of Grayscale sheds light on Ethereum Classic [ETC] by defining it as a digital currency that can be applied in Internet of Things [IoT] and also flexible. Preceding Ethereum Classic [ETC] in the list of Grayscale holdings is Bitcoin [BTC], which holds $1385.3 million. Currently, Ethereum Classic [ETC] is ranked as the 13th most valuable crypto, according to CoinMarketCap. However, a few days back, this particular digital currency briefly beat Tron [TRX] and Monero [XMR] to attain the 11th position. Recently, the inclusion of Ethereum Classic [ETC] in the trading list of Coinbase, a prominent cryptpcurrency exchange has been among top crypto news. Also, a U.S. based crypto exchange Bittrex will be offering U.S. dollar [USD] trading for two cryptocurrencies – Ethereum Classic [ETC] and Ripple’s XRP. At the time of writing, Ethereum Classic [ETC] had declined 7.5 percent against USD to trade at $15.01. The trading volume of this cryptocurrency in the past 24 hours is $347.91 million while its market capitalisation is marked at $1.56 billion.